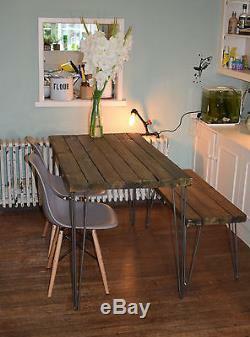 Industrial Kitchen table Bench and x 2 Chairs Mid Century Modern. Here we have a Stunning handmade kitchen table x 2 chairs and Bench It is made from quality wood that has real character as you can see from the photos. Mid-century modern/Industrial design with steel hairpin legs this table would look great in any room with this styling. Varnished in a dark oak. 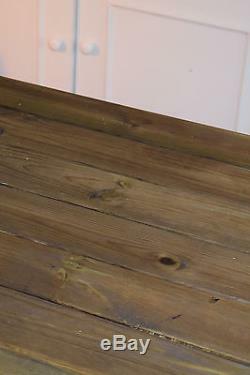 Each item is handmade after ordering using the finest hairpin steel legs and Chestnut we make each table with love. 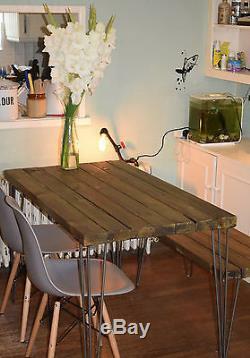 (please be aware this table is rustic to fit its industrial feel). Tables will arrive fully fitted apart from the legs (10mm unfinished steel) (screws provided) which will need to be screwed in. Legs and chairs may be sent direct from our suppliers. Collection is from Ealing W13 or. Alternatively we can COURIER your item via our great network of UK MAINLAND couriers. The item "Industrial Kitchen Table Bench and x 2 chairs Mid Century Style hairpin" is in sale since Thursday, July 27, 2017. This item is in the category "Home, Furniture & DIY\Furniture\Tables\Kitchen & Dining Tables". 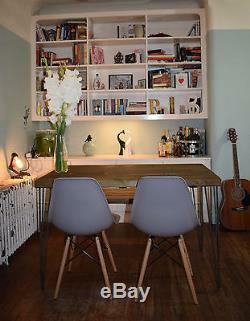 The seller is "midcenturymoderndesignstudio" and is located in London. This item can be shipped to United Kingdom.